For many APIs it is desirable to authenticate requests made to an endpoint. For an interactive voice response (IVR) system API which returns TwiML, the only entity that should likely be allowed access in production is Twilio. This post will cover implementation of request signature validation in a Python IVR web application that uses the Pyramid web framework. For this demo the HTTPS link will be used. Copy it, and we’ll paste it in the next section. To follow along with this demo a Twilio account is required, as the auth token associated with the account is an integral part of request validation. A Twilio account may be created here. The “Common Stumbling Blocks” section below explains the trailing slash inclusion. Proceed to the console dashboard to obtain the account’s auth token, which is circled below. Note that the use of a TWILIO_AUTH_TOKEN environment variable is to prevent inclusion of this sensitive information in a config file or source code, where it may be accidentally version controlled. In production systems, a more robust solution for safely including the auth token in a Twilio app may be desirable. For additional information on building applications in Python with the Twilio Voice API, see the quickstart documentation. 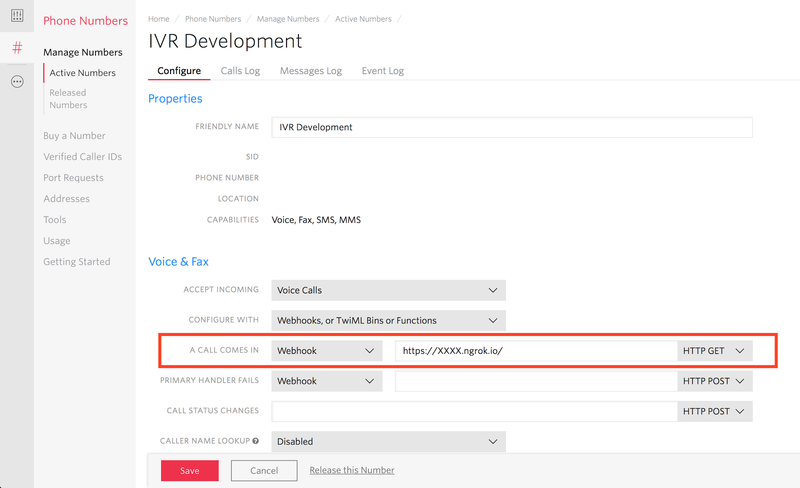 When the webhook configured to handle incoming phone calls receives a request from Twilio, the request header will contain an X-Twilio-Signature. This value, along with the account’s auth token is all that is necessary to determine if a request actually originated from Twilio. Note: The process by which Twilio generates this header value is delineated here. In determining if a request to a certain endpoint should be allowed, Pyramid takes two concepts into account: authentication and authorization. Authentication may be thought of as checking if the requester is who they claim to be, and authorization may be thought of as checking if the requester has permission to do what they are attempting. Verifying request signatures is an authentication concern and should be handled via the Pyramid app’s authentication policy. Pyramid includes no authentication policies which cleanly allow for only validation of Twilio request signatures. They all center around a userid and facilitate the creation and usage of sessions. Pyramid’s AuthTktCookieHelper comes close to a good fit, but it provides a lot of extra functionality that is not necessary for simple, stateless request validation. Thankfully, Pyramid makes it easy to define and include a custom authentication policy. A canonical authentication policy should implement the IAuthenticationPolicy interface and define all of its methods; however, doing so will result in a far more fully featured policy than is necessary for this demo. Note: Twilio also supports HTTP basic authentication and Pyramid includes a BasicAuthAuthenticationPolicy out-of-the-box. This tutorial focuses only on digest authentication which may be preferable as it does not require the inclusion of credentials in every request URL where they may be susceptible to interception. The custom TwilioSignatureAuthenticationPolicy defined for this demo contains an effective_principals method definition. This is the only method Pyramid requires for an authentication policy to be compatible with the ACLAuthorizationPolicy. A Pyramid app will call the authentication policy’s effective_principals method for each HTTP request to one of its endpoints, making this a convenient location to include the Twilio RequestValidator. If the signature generated by the RequestValidator does not match the X-Twilio-Signature attached to the request, then the authentication policy will not include the Twilio principal in its list of effective principals and the requester will be denied access to any endpoint requiring “view” permission. The URL passed to the RequestValidator.validate method must be identical to the one used by Twilio. Concerns such as trailing slashes and request URI schemes – either http or https in the case of Twilio – must be taken into account. If the Pyramid application that has been configured to serve as the call handler sits behind a load balancer, or any service which terminates TLS, it is critical that these lines appear in the app’s configuration file. Failure to include them will result in calls to Pyramid’s various URL generation methods returning URLs with the incorrect scheme (i.e. 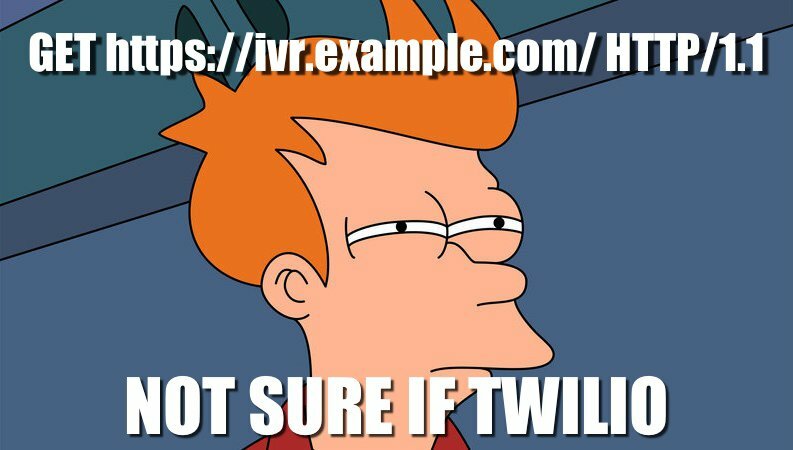 http://ivr.example.com instead of https://ivr.example.com). # sits behind an ELB which terminates TLS. "My apologies. We seem to be experiencing technical difficulties. " "You will now be redirected to our call center for assistance." The above code defines views to handle 403, 404, and 500 errors. In the event one of these errors occurs, the custom message defined above will be read to the user. It is important that the status code is set to 200, as a failure to do so will result in Twilio ignoring the TwiML we send and defaulting to the stock error message. If any issues are encountered while attempting this tutorial, please note them in the GitHub repo issue tracker so they can be resolved in a timely manner. my GitHub profile is https://github.com/patrickyevsukov/.